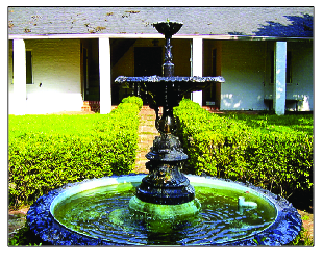 In the courtyard of the Lemee House located on Jefferson Street, there is a decorative fountain. It was moved there many years ago, but the original location was on the river side of Front Street at the head of St Denis Street. Before Natchitoches had automobiles, the fountain was used as a drinking place for horses during the era of horse-drawn vehicles. The money needed to purchase the fountain was raised by several civic-minded women under the leadership of Miss Rena Phillips. One such event occurred in 1901. when Miss Rena Phillips organized a children’s operetta that was given at the Opera House on Monday night, July 4, 1902. When she died, the fountain was officially named the Rena Phillips Fountain in her memory. In the June 24, 1915 issue of the Natchitoches Enterprise, it reads, “The playing of the Rena Phillips Fountain is delighting the visitors as well as the town people who have watched it with interest since the water was turned on last Friday. The young lady to whose memory the fountain was dedicated five years ago, gave a series of entertainments until she raised enough money for the purpose and though she selected and ordered it, it was irony of fate that it should reach Natchitoches, just about the date of her untimely death. So it was a sacred ceremony and a beautiful tribute to Miss Phillips memory, when the lovely fountain was publicly dedicated, a simple but imposing ceremony in which the whole town and Normal school participated and it has been a matter of great disappointment that during all these years it was not used for the purpose for which Miss Phillips worked so earnestly. “But now thru the indefatigable efforts of the Supt of Water and Lights, Mr. Walter Aymond, the Rena Phillips Fountain will give drink to the thirsty public and will stand for ages as a public testimonial to this young lady’s spiritedness and civic interest in her beloved Natchitoches.” Rena Phillips is buried in the Hebrew-Jewish Cemetery located on MLK Dr., Natchitoches.